Stropharioid mushrooms are small to medium-sized saprobes that appear on dung, woody debris, forest liter, or grass. They have purple-brown to purplish black spore prints, and partial veils that usually form rings on the upper stems. The gills are attached to the stem and, by maturity, they are often purplish gray, with whitish edges. The caps are convex and, when young and fresh, usually sticky. Under the microscope, stropharioid mushrooms feature ellipsoid spores that are brown in KOH, and there are usually cystidia on the gills. "Chrysocystidia," which feature refractive, globular inclusions, are found in many stropharioid mushrooms. My collecting experience with stropharioid species leads me to believe that the application of KOH on the cap surface results in some fairly distinctive color reactions. Perhaps this is an area of Stropharia identification that should be explored. The traditional genus Stropharia has been split up and reorganized as a result of DNA studies, resulting in Leratiomyces and a more narrowly defined Stropharia. It is these two groups—Stropharia and Leratiomyces—I am calling "stropharioid" mushrooms. Some mycologists (e.g. Noordeloos, 1999) have treated Stropharia within the genus Psilocybe—but Psilocybe, it turns out, actually represents at least two very different groups of mushrooms, neither of which is as closely related to Stropharia and Leratiomyces as they are to Hypholoma and Pholiota (see The Strophariaceae for an extended discussion). And so on. I say we should just use the same strategy they recommend for merging onto the Interstate: pick a spot, accelerate, and get on the highway. Call it a Stropharia, a Psilocybe, or a Leratiomyces, but don't sit there on the ramp crying about the traffic, because we've got places to go and mushrooms to see when we get there! 1. Fresh cap scarlet to orange. 1. Fresh cap otherwise colored (brown, tan, yellow, wine red, purplish, white, green, blue). 2. Found in woodchips, landscaping areas, waste places (and so on) in coastal California (perhaps elsewhere? ); stem smooth to finely hairy. 2. Found in woods across North America; stem shaggy. 3. Cap with blue or green colors (if stem bruises blue, see Psilocybe). 3. Blue or green colors absent. 4. Gill edges colored like the faces during all stages of development; chryso-cheilocystidia abundant. 4. Gill edges often whitish at maturity, contrasting with the faces; chryso-cheilocystidia absent or very rare. 5. Cap dark green to dark blue when young, often fading to yellowish; ring fairly well developed, at least when young. 5. Cap bluish or greenish when young, but becoming whitish with faint bluish tints; ring poorly developed, even when young. 6. Mature cap medium sized to large; regularly greater than 5 cm in diameter. 6. Mature cap small; rarely greater than 5 cm in diameter. 7. Cap without scales, typically wine red when young, becoming brownish--but occasionally brownish when young, or in one form white in all stages of development; ring prominent and well developed, with distinctive bent-back scales or "claws" on its underside; growing in woodchips, landscaping areas, mulch, and so on; spores 11-14 x 7-9 µ. 8. Found in western North America (especially northern California and the Pacific Northwest); tall (mature stem 8-15 cm long); cap slimy and yellow, fringed with drooping white veil remnants on the margin. 8. Not completely as above. 9. Stem conspicuously scaly, especially when young. 9. Stem smooth, fibrillose, or slightly shaggy when young, but lacking conspicuous scales. 10. Cap yellow and dry, innately scaly ("scales" not merely veil remnants; not easily rubbed off); spores not longer than 8 µ. 10. Not completely as above. 11. Young cap purple brown to reddish brown; stem 1-2 cm thick; chrysocystidia present on gill faces. 11. Young cap yellow to orangish brown; stem .5-1 cm thick; chrysocystidia absent. 12. Found in hardwood forests in eastern North America; cap dull brownish yellow; ring thin but persistent and membranous; spores 6-7 µ long. 12. Found in western North America under aspens, cottonwoods, and alders (especially in riparian ecosystems); cap yellowish to whitish; ring fragile, soon disappearing or remaining only as a zone of fibrils; spores 13-16 µ long. 13. Young cap wine red; reported from piles of hardwood debris in flooded lowlands in Illinois and Indiana. 13. Cap otherwise colored; distribution and ecology various. 14. Stem shaggy-scaly; cap slimy, dull yellow to orangish; found in woods; spores 12-14 µ long; chrysocystidia absent. 14. Not completely as above. 15. Growing in grass, on dung, in woodchips, in gardens, and so on. 16. Found in western North America under aspens, cottonwoods, and alders (especially in riparian ecosystems); mature cap 3-5 cm across; spores 11-15 µ long; chrysocystidia apparently absent. 16. Not completely as above. 17. Cap whitish (sometimes with a yellowish center); fresh stem dry; reported from Michigan and California. 17. Cap honey yellow; fresh stem with a slimy sheath; reported near Seattle "among leaves in woods" and from Oregon "on humus under spruce." 18. Ring fairly persistent, usually remaining throughout development. 18. Ring ephemeral, usually disappearing with maturity or persisting merely as a zone of fibrils. 19. Fresh, young cap whitish; spores 10-13 µ long. 19. Fresh, young cap yellow to yellowish; spores 7-11 µ long or 13-16 µ long. 20. Growing in grassy areas across North America; spores 7-11 x 4.5-5.5 µ. 20. Growing in wood chips and in waste places on the West Coast; spores 13-16 x 7-9 µ. 21. Fresh stem with a slimy sheath; cap convex to nearly round, but not bell-shaped; spores 15-19 µ long. 21. Not completely as above. 22. Growing in wood chips in western North America; cap 3-5 cm across, yellow becoming whitish; spores 11-15 � long. 22. Not completely as above. 23. 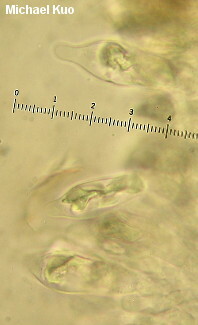 Cap 1-2.5 cm across, bell-shaped, yellowish brown with a darker center; spores 17-19 µ long. 23. Cap slightly larger than above, convex to planoconvex, paler than above; spores shorter. 24. Stem about 2 mm thick; widely distributed in North America. 24. Stem about 5-10 mm thick; apparently eastern in distribution. Atkinson, G. F. (1906). Two new species belonging to Naucoria and Stropharia. Journal of Mycology 12: 193–194. Bas, C. & M. E. Noordeloos (1996). Notulae ad floram agaricinam neerlandicam XXIX: Two new species of Psilocybe. Persoonia 16: 239–44. Bridge, P. D., B. M. Spooner, R. E. Beever & D. -C. Park (2008). Taxonomy of the fungus commonly known as Stropharia aurantiaca, with new combinations in Leratiomyces. Mycotaxon 103: 109–121. Guzmán, G. (1980). Three new sections in the genus Naematoloma and a description of a new tropical species. Mycotaxon 12: 235–240. Guzmán, G. (1983). The genus Psilocybe. Germany: J. Cramer. 439 pp. Murrill, W. A. (1912). The Agaricaceae of the Pacific Coast: III.Mycologia 4: 294–308. Noordeloos, M. E. (1995). Notulae ad floram agaricinam Neerlandicam—XXIII. Psilocybe and Pholiota. Persoonia 16: 127–129. Noordeloos, M. E. (1999). Strophariaceae. In Bas, C. et al., eds. Flora Agaricina Neerlandica Volume 4. Rotterdam: A. A. Balkema; pp 27–107. Noordeloos, M. E. (2001). Studies in Psilocybe sect. Psilocybe. Osterr. Z. Pilzk. 10: 115–180. Ramírez-Cruz, V., G. Guzmán, A. R. Villalobos-Arámbula, A. Rodriguez, P. B. Matheny, M. Sánchez-Garcia & L. Guzmán-Dávalos (2013). Phylogenetic inference and trait evolution of the psychedelic mushroom genus Psilocybe sensu lato (Agaricales). Botany 91: 573–591. Ryman, S. (2008). Stropharia. In Knudsen, H. & J. Vesterholt, eds. (2008). Funga Nordica: Agaricoid, boletoid and cyphelloid genera. Copenhagen: Nordsvamp. 851–855. da Silva, P. S., R. M. B. da Silveira & V. G. Cortez (2014). Notes on Deconica and Psilocybe (Agaricales) from the southern border of Atlantic forest and Pampa biomes of Brazil. Sydowia 66: 217–228. Smith, A. H. (1937). Notes on agarics from the western United States. Bulletin of the Torrey Botanical Club 64: 477–487. Smith, A. H. (1941). Studies of North American agarics—I. Contributions from the University of Michigan Herbarium 5: 1–73. Smith, A. H. (1951). North American species of Naematoloma. Mycologia 43: 466–521. Smith, A. H. (1979). Stropharia riparia, a previously undescribed species suspected of occurring in Michigan. The Michigan Botanist 18: 107–108. Stamets, P. E. (1978). Psilocybe mushrooms and their allies. Seattle: Homestead Book Company. 160 pp. Stamets, P. E., M. W. Beug & J. E. Bigwood (1980). A new species and a new variety of Psilocybe from North America. Mycotaxon 11: 476–484. Stamets, P. (2003). Psilocybin Mushrooms of the World: An Identification Guide. Berkeley, CA: Ten Speed Press. Vesterholt, J. (2008). Psilocybe. In Knudsen, H. & J. Vesterholt, eds. Funga Nordica: Agaricoid, boletoid and cyphelloid genera. Copenhagen: Nordsvamp. 844–851.